“Long ago, the Viet people were attacked by foreign aggressors. The Jade Emperor sent the Mother Dragon and her band of Dragon Children to help the Viet people fight the invaders. While the enemy vessels were launching massive attacks against the mainland, the dragons descended in flocks from the sky. They spat out innumerable pearls which changed into jade stone islands the moment they touched the water. These islands linked together to form firm citadels that checked the enemy’s advance and smashed their vessels to pieces. This floating village of about 50 families has a population between 200 and 300 residents, including almost 100 children. These families have lived in this village for generations. The village is a “floating village” with no structures built on land. Traditionally, income for food and potable water (imported from the mainland) came solely from fishing. Now tourism provides an additional source of income. Their floating houses look spacious and clean. One community house is where villagers come to have meetings. This is also the place where tourists stop over to buy traditional handmade items. It is interesting to see the lively children going to “school”. Their bustling calls and the sound of their oars breaking water enliven the atmosphere of the quiet bay. Looking at the small boats driven by tiny oars and the radiant faces of the children going to school, one feels confident in a bright future for the fishing village. 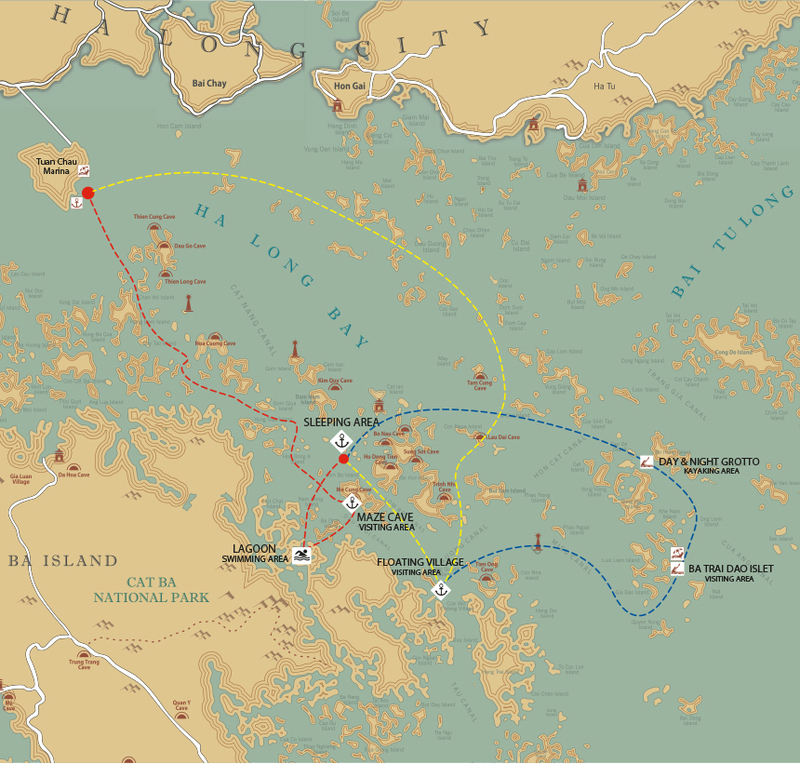 Thirty-five years afterwards, on 27 June 1997, Ti Tốp returned to the island having his name. Deeply moved, he wrote in the souvenir book of the Management Board of Hạ Long Bay: “My deepest thanks to destiny, which has allowed me to come back to this tiny island.” It has become a beach attracting many visitors. Ascending to the grotto, the way is covered by trees and foliage, and consists of great paved stone blocks. Inside, it is partitioned into two chambers; the first one being similar to a wide theatre hall. Many strangely shaped stalactites hang from the high ceiling. At the deepest point of the grotto, a “royal garden” appears with a clear pond and a seemingly fascinating landscape of mountains. Many birds and plants (benjamin figs, cycads and centenary banyan trees) live here. On fine days groups of monkeys might arrive in search of fruit. At the water-level, an arched entrance leads to the grotto, just at the base of the island. Passing through the pretty entrance, you come across a tranquil round lake, surrounded by luxuriant trees and high dangerous stone walls. Monkeys run to and fro in groups, benjamin fig trees shade the landscape and many orchids hang their sweet-scented flowers. In the lake, many species abound: shrimp, fish, crab and cuttle-fish. The beauty of the site, is the mingling of a number of factors: the mountain’s size and form, the color of the water and the clouds. Today, Ba Trái Ðào is a famous tourist attraction with three nice fairy beaches, romantic landscape. It is 22 km from south north of Bãi Cháy Tourist Wharf. Recently, Soi Sim Islandis received more regards in developing tourism. 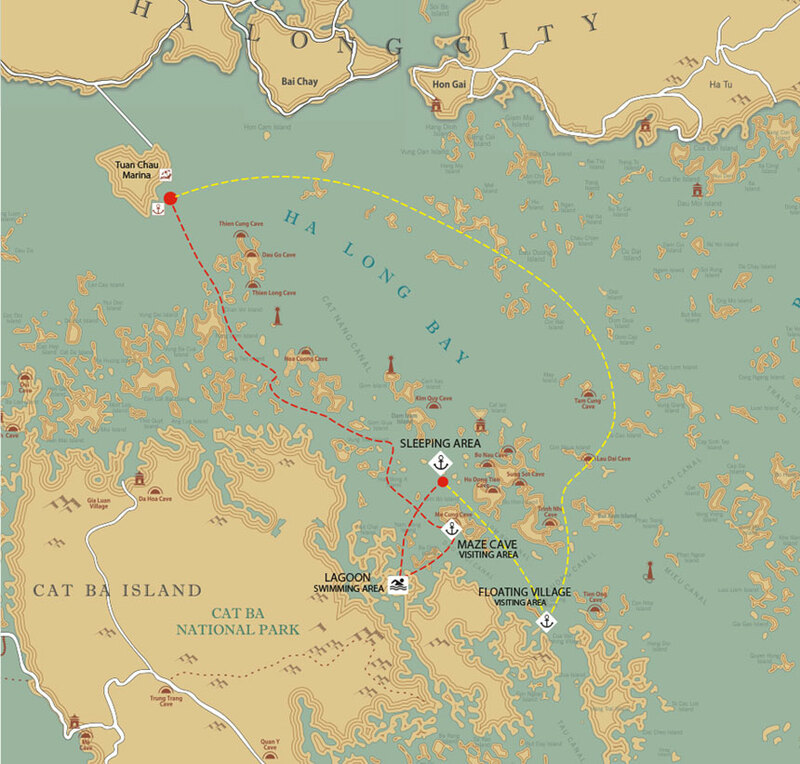 Halong Bay Management Board set up a plan to planning the island to be an eco-tourist site which brings both economic interest and value of preservation. In the near future, Soi Sim Island will become an attractive holiday resort right in the center of Halong Bay, the World Natural Heritage. Cruising map 3days 2night .